Welcome to St. Simons Island, part of The Golden Isles, home of St. Simons Island, Sea Island, Little St. Simons Island, Jekyll Island, and Historic Brunswick, all lining the 99 mile coast of Georgia. I was recently hosted by The King and Prince Beach & Golf Resort for a luxurious four-day, three-night tour of the island, the food, and the resort. I'm going to share the experience with you in a three-part series, beginning with the sights and sightseeing on the island. Although we were guests of the resort, it was important to them that we experience some of what the island has to offer, which made the experience whole. There were 18 writers in our group, from all over the country. There were two from California, two from Las Vegas, and few from Florida, as well as many other places. A few of us were there from Atlanta, from which the resort is an easy drive for a long weekend or week-long stay. 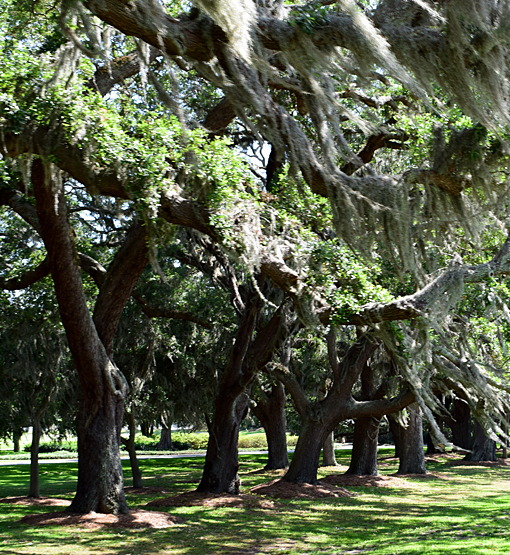 One of the first-noticed characteristics of St. Simons Island is its canopy, which includes thousands of live oaks, the official State Tree of Georgia. 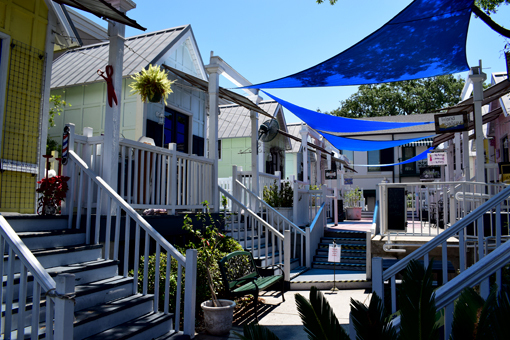 Also, you'll notice that the structures on St. Simons Island are no taller than the canopy of their property—a law that keeps this charming town such a magical destination. Live oaks can live to be several hundred years or even 1,000 years old, so the charm they bring St. Simons Island will be around for generations to come! In its early years, St. Simons Island was home to a thriving lumber business. Wood from the live oak is so dense, timbers from the island were used to construct the frigate U.S.S. Constitution—nicknamed "Old Ironsides". Commissioned in 1794, the ship was instrumental in the War of 1812—going 33-0 in battle—and is today on view to the public at Charlestown Navy Yard in Boston. One of the more impressive showings of live oaks on St. Simons Island is the Avenue of the Oaks. The double-row of oaks were planted in 1827, when the property was Retreat Plantation. One hundred years later, in 1926, the property was purchased to create Sea Island Golf Club, which opened in 1928, and today is still beautifully adorned with live oaks. We had a packed agenda, but also had some personal time scheduled. We could enjoy the pool, walk the beach, enjoy a massage at The Royal Treatment Cottage (part of The King and Prince), do some work or even take a nap. One afternoon, we got to meet Lee and Andi of Ocean Motion Surf Shop (with a location one block from the resort) and Barry's Beach Service. They shared with us some of the awesome services they offer guests and others visiting the beach. 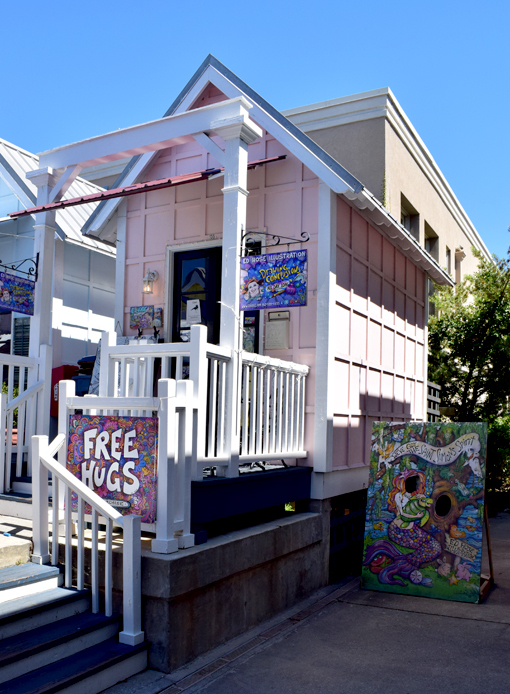 To name a few, they offer bike rentals, guided kayak nature tours, sailboat rides and lessons, beach chair and umbrella rentals, and their super popular stand-up paddleboard rentals. I was so tempted to go on a bike ride, perhaps over to East Beach, to explore some of the 21 miles of bike paths on the island, and will definitely plan on just that on my next visit! TIDES! 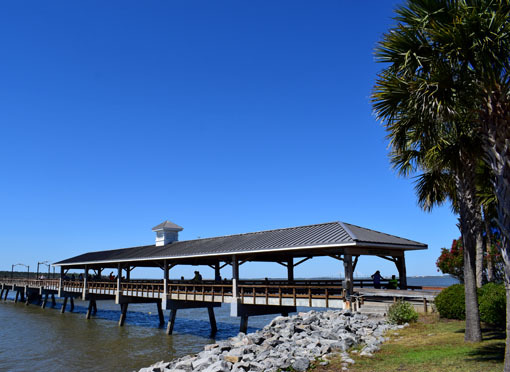 One extremely important piece of information a tourist will need during a visit to St. Simons Island it a tide table, or at the very least a heightened awareness of the drastic changes in tide levels. The tide variance on St. Simons Island can be 7 feet to considerably more in spring and fall, as well as periods of a full moon. Enjoy your time at the beach, just don't get caught on a sand bar because you missed the tide. 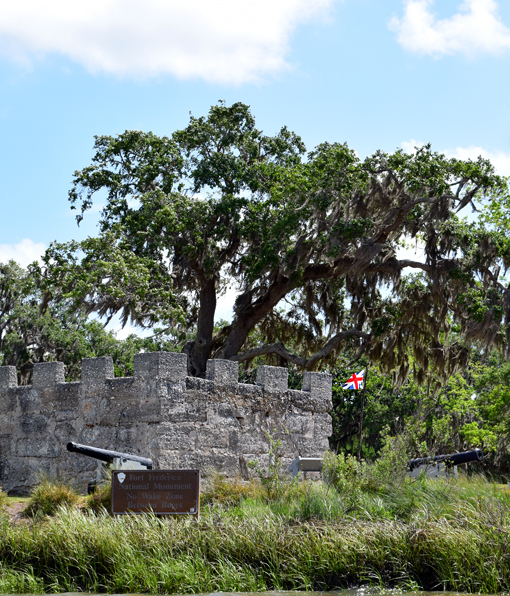 I've visited a lot of forts over the years, but this visit was unique in that we had the opportunity to see Fort Frederica from our tour trolley and later by boat. It was here in 1742 that fate of the colony of Georgia was decided. The fight was a battle between Spanish and English forces. Following the Battle of Bloody Marsh (in which seven Spanish lives were lost), James Edward Oglethorpe (founder of Georgia and namesake for Oglethorpe University here in Atlanta) sent disinformation to the Spanish, via a freed prisoner, regarding arriving reinforcement numbers. Never again was Georgia disputed as being under English rule...not until the Revolutionary War. 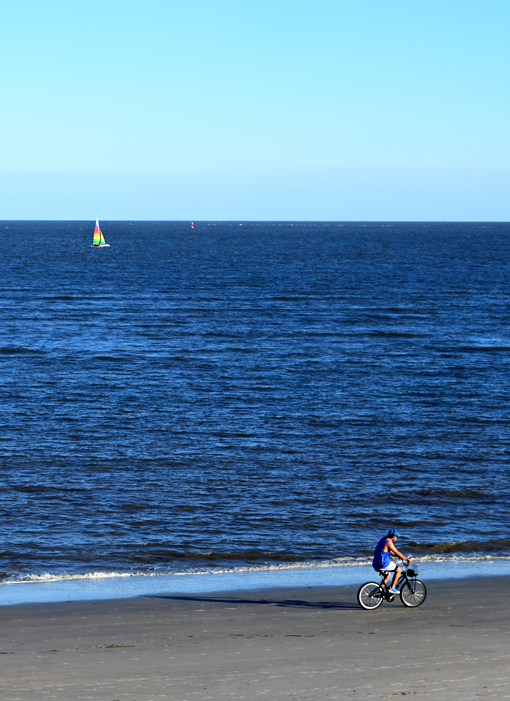 St. Simons Island is such a relaxed place, you might not realize just how much history there is to discover here. 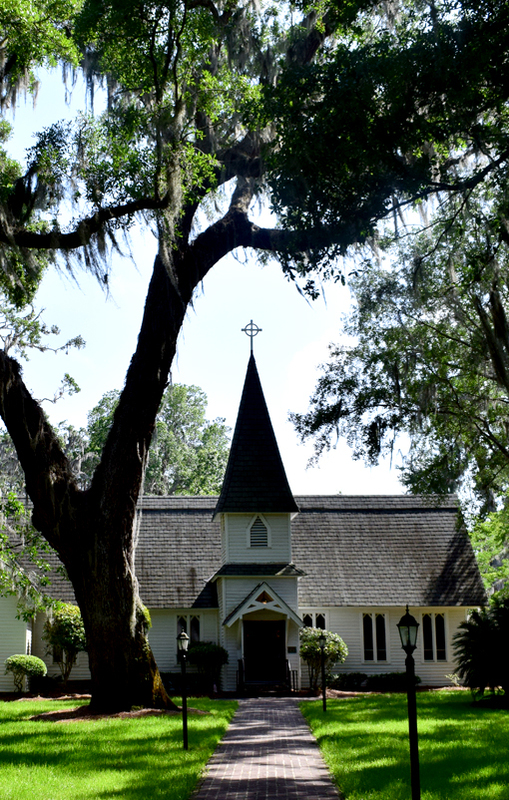 One of our tour stops included a tour of Christ Church, Frederica. The church's roots date back to around 1736 with Rev. Charles Wesley's ministry at Frederica. He served as Secretary for Indian Affairs and was Chaplin to General James Oglethorpe, founder of Georgia! Prior to the first church building being built in 1820, the congregation met under the canopy of majestic live oaks on the property. That church was destroyed during the U.S. Civil War, but it was rebuilt on the same site after the war, the very church we visited on our tour. A church volunteer shared some of the church's rich history with us, including some information about the stunning stained-glass windows throughout. Afterward, we toured the church grounds when we heard more fascinating church history. Some of the headstones in the church's cemetery date back to 1803! When I travel, my usual souvenir is a book about the place I'm visiting. Christ Church has a cookbook with hundreds of recipes—including "St. Simons Island Chicken", which I must try sometime soon!—and gorgeous photos of the church's stained-glass windows with a brief description of each and its dedication. If golf is your thing—or even if you're a novice—be sure to take advantage of the King and Prince Golf Course, extensively restored and renovated less than 10 years ago. The course is not directly connected to the resort, but visitors can arrange transportation to the course through the hotel. I haven't played in a very long time, but was incredibly tempted! This is an award-winning, stunning course is sure to be a treat for every golfer. Our tour guide on many of our outings was the totally awesome Cap Fendig, a lifelong resident of St. Simons Island and a member of one of the oldest families on the island. 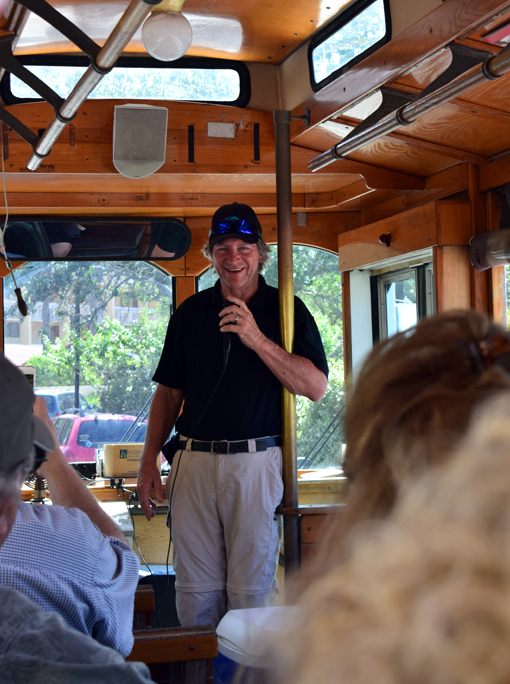 His tours include the Lighthouse Trolley Tours, St. Simons Dolphin Tours (THAT was an awesome experience! ), and private boat tours, to name a few of the offerings. 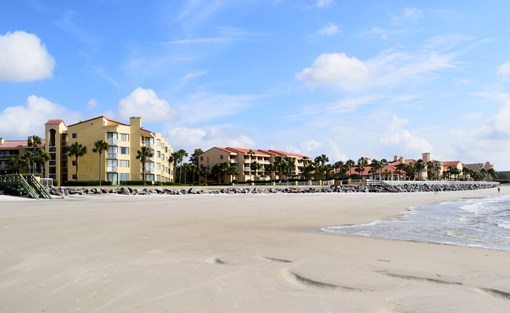 Cap Fendig is the expert you want when you're ready to explore St. Simons Island! He's informative, insightful and perhaps most importantly, he's funny! On one morning of our visit, we had breakfast in the Pier Village district, a popular destination for shopping, sightseeing and dining. We had a little free time after breakfast so I perused Pier Market Village (pictured above); walked the Pier where people were fishing, relaxing and socializing; and briefly popped into Neptune Park, an oceanfront public park with a playground, 18-hole miniature golf course, and a pool area! 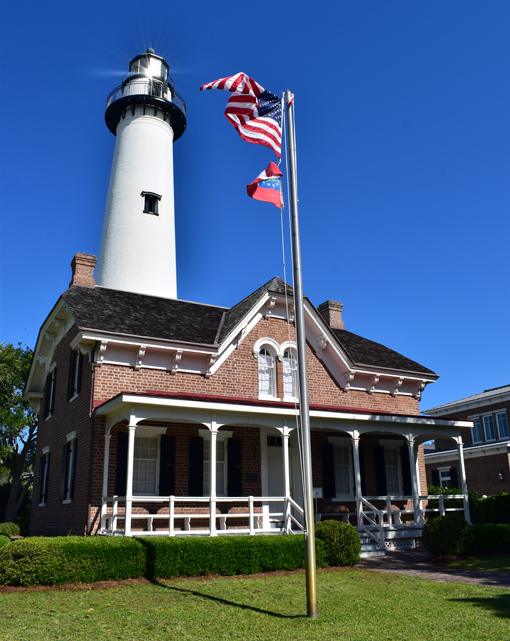 The one attraction I was most looking forward to visiting was the St. Simons Lighthouse, and climbing its 129 steps to the gallery—the balcony surrounding the lantern room—for the spectacular vistas of the Golden Isles. The St. Simons Light was first lit in 1810! The original lighthouse was constructed of tabby and was octagon shaped. That one was destroyed during the U.S. Civil War. Lit in 1872, the "new" St. Simons Lighthouse continues to welcome ships into the port of Brunswick today. Impressively, the original third-order Fresnel lens remains in the lighthouse today, still operational and visible to ships 23 miles at sea! The St. Simons Lighthouse Museum is in the connected former Keeper's Dwelling, and a fine museum it is. The museum houses rare artifacts, historical photographs and interactive displays. There are also two cylindrical displays chronicling the history of each of the lighthouses to occupy the area, mere feet from each other at different times in history. The Pier, at the front of Neptune Park, is bustling with activity! I don't know exactly when it was built, but I've seen photos of it dating to the 1940s. It's a popular destination for a daytime walk or an evening stroll after dinner. One of our excursions was to the Golden Isles Convention and Visitors Bureau, which houses a local art gallery, an artisan gift shop (where I purchased another book—Georgia's Lighthouses), a large-format professional photography exhibit, and, of course, brochures to any and everything one could want to see or do in St. Simons Island! 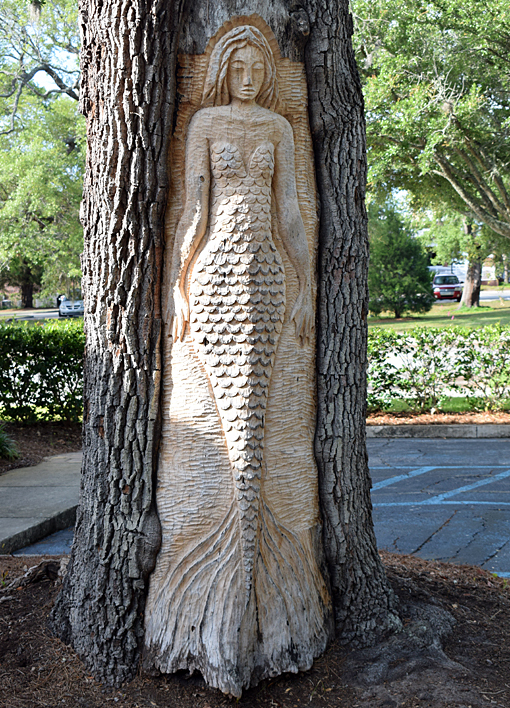 It was there that we learned about Tree Spirits, and got to see up-close-and-personal the Mermaid Tree Spirit, carved into an area of the tree damaged by a lightening strike! The above photo is ED Hose's amazing shop in Pier Market Village. We had a little extra time on one of our excursions and I happened upon the shop. A couple of days later, we were gifted a copy of The Princess and the Crab and I remembered the artist's name. The book is filled with places we visited, so, with excited inspiration, I mapped my writing of "Part 1 - The Sights" onto the story! When you stay at The King and Prince Beach and Golf Resort, I hope you'll visit some of or all of these wonderful destinations. There are considerably more than what I've noted here, but I have to leave something for you to discover, right? A very special "Thank you!" to The King and Prince and to Leigh Cort Publicity (Leigh, you're AMAZING!). And a reminder to my readers that while this was a hosted trip, all opinions are my own. Safe travels! Terrific and thorough review of St Simon Island. It was fantastic meeting you there and I look forward to more of your articles about the area!